Imagine a paradise where massive lakes and glacial peaks dominate a volcanic landscape that has more trails than roads. A place with enough campgrounds, hotels, and amenities to absorb massive crowds, but still an abundance of nearby wilderness to quickly escape them. Imagine having your activities limited only by your ambitions. Want to go do some world class mountaineering? The nearby Minarets got you covered. Would your two year old child rather spend the day throwing rocks into a lake? Sure, why not? Imagine not having to worry about leaving your dog behind, because all of the surrounding wilderness is dog friendly. Now, stop spending so much time imagining, and make your way to Mammoth Lakes sooner rather than later. Life is too short to skip out on places like this. This July we decided to try a family vacation to the area. With our son Owen in tow, our trip emphasized more low key activities, mainly of the rock throwing variety discussed earlier. It’s pretty easy to idle away a few hours on a lakeshore with views like this, so I wasn’t about to complain. As expected, the call of the trail did eventually prevail though. Restless souls can only linger for so long no matter how beautiful a place is, and Callie and I were itching to explore the area some more. We opted to head up the Crystal Crag trail from Lake George to Crystal Lake. It’s short and easy enough for people of almost any age while still feeling like a proper High Sierra hike; a perfect compromise for our diverse group. The trail starts at the parking lot alongside Lake George, but views of the lake are quickly traded in for a shaded forest trail. The trail gets a reasonable amount of use given its ease of ascent and access, but it still felt quite calm on a beautiful summer weekday. The majority of the ascent to Crystal Lake traverses through wooded sections like this with limited views. Fortunately, the forest features some of the tallest trees I’ve seen in the Eastern Sierra, and the trail is immaculately groomed which makes it easy to enjoy your surroundings while you move through. As the trail gains elevation, views of Lake George and Mary begin to show up alongside the trail. These stretches are short but the vistas are more than beautiful enough to make up for it. And so it goes for the next half mile. The trail alternates between epic views of the surrounding lakes and mountains, to more mundane but still perfectly pleasant forest scenes. After a little over 500 feet of ascent, the trail reaches a saddle, where it begins a brief drop down to Crystal Lake. The forest blocks any evidence of the lake, but with Crystal Crag looming nearby it was clear that we were close. After a brief stroll down the hill, we reached the outlet to Crystal Lake, where Callie enjoyed a dip in the water. The outlet stream has a nice area of shallow water which would have been great for Owen and Callie, but we spied a beach on the opposite shoreline that looked even better and had a much higher chance of solitude. We made our way down the lake’s eastern shore along a network of use trails that are more established than plenty of marked trails in the surrounding wilderness. All the while, views of the lake and Mammoth Crest continued to keep things interesting. Upon arriving at the southern shore of the lake, it was clear that our extra effort had been well worth it. There was another woman there with some anti-social dogs, but the shoreline gave us plenty of room to spread out and give each other space. Shortly thereafter she left, and we had the beach all to ourselves. The shoreline here is about as good as you can hope for in a Sierra lake, at least from our perspective. The sandy beach dips into the water and creates a shelf perfect for toddlers or dogs like Callie to get their feet wet. Callie loves the water but is deathly afraid at the prospect of having to swim in it. Owen quickly resumed his routine of throwing rocks and sticks into the lake, and with that we had come full circle. No matter how eloquently I try to express the merits of leave no trace to my son, it just isn’t sticking yet. That lasted for quite awhile, but all things must pass. I don’t remember whose patience wore thin first, probably mine. Left to his own devices, Owen most likely would have stayed in the lake throwing rocks into the early evening until perishing from hypothermia. Sometimes it just isn’t practical to let a two year old plan the trip agenda. On the way back, we were able to appreciate the views even more since the trail’s grade naturally frames your perspective down towards the magnificent lake basin. Callie lingered on these views and opted to cruise through the forest sections. She has become well versed on my habits on the trail. Back at the trailhead, we took a moment on the shore of Lake George to appreciate Crystal Crag from a different perspective. The western face that we had been looking at from Crystal Lake makes it appear to be an impressive mountain, but the steeper eastern face and view from Lake George does a better job of illustrating just how precipitous the knife edge ridge line of the crag is. We left with an even greater appreciation of the hike we just finished and an eager anticipation for future adventures in the area. Mammoth Lakes was our family getaway for years and my kids absorbed a love of the outdoors that has followed them into their 20’s. I go back every year to hike the area. Try Juniper Ridge hike sometime, trail begins just outside the Minaret Summit Viewpoint up from Mammoth Ski area. Beautiful views of the Ritter Range and Long Valley towards Mono Lake. Thanks for the tip. I was eyeing the crest all day and can’t wait to explore that trail. I think this is my favorite to date. The photos your took are amazing. The lakes, the trees, the entire scenery is magical. Thank you for sharing them. As always, I look forward to your next adventure. Thank you so much Sonia, I’m so glad that you enjoyed the post. Thanks for the preview. 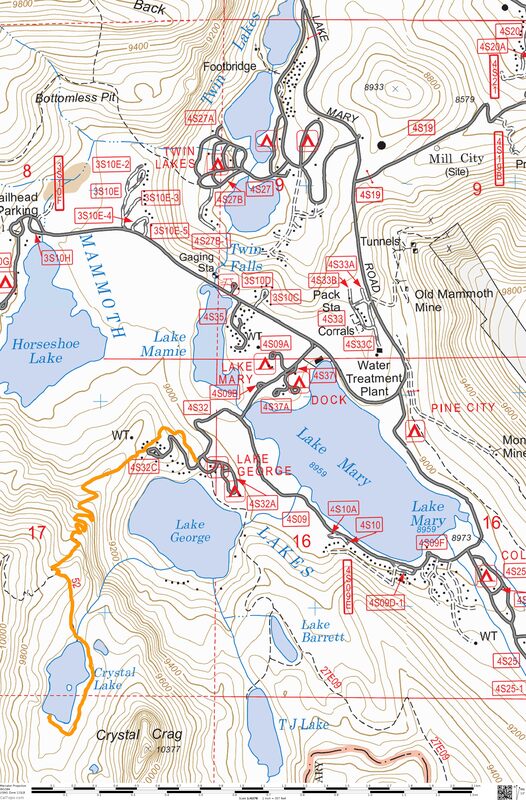 I’ll be vacationing in Mammoth next week and I had made a decision this past weekend to make Crystal Lake my first dayhike. Last time I was there was in 2011 after the heavy snow and I kept losing the trail. Glad to hear it’s easy to follow now. Excellent trip report and, as always,quintessential photos! I look forward to your next post. Spectacular photos! I enjoyed this post very much. I can’t wait to do this hike with my pup next summer. Thank you for sharing!